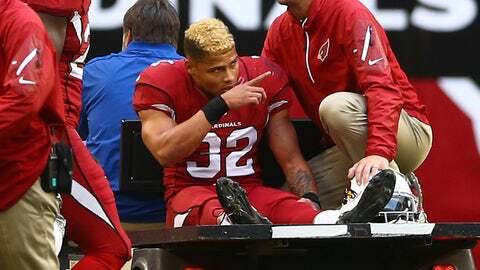 Tyrann Mathieu will have season-ending surgery Friday to repair his ACL and LCL and will not travel with the Cardinals for their games the next two weeks. "I felt it when the guy kind of jumped on my leg, but I felt like I could run it off," Mathieu said Thursday at the team’s Tempe complex. "Once I got to the sideline, it just buckled. "I’ve twisted my ankle, sprained my ankle a few times, but I havenât had a serious injury. Once my knee buckled, I knew it was a serious injury." "I heard that," Mathieu said, smiling. "Coach is just being generous. He doesn’t want to rush me back, but hopefully everything goes well and goes fast and I can come back like A.P. (Vikings running back Adrian Peterson)." The harder the battle, the sweeter the victory . "You don’t know what to do with your time. It’s kind of boring. That’s the only frustrating thing I’ve come across," said Mathieu, who won’t travel with the team to Tennessee or Seattle the next two weeks. "I’m sure it will be all types of emotions. I can’t travel with those guys, but they know I’ll be locked in, tuned in." "To take away the thing he loves the most and works so hard for, he was devastated," Arians said, noting that Mathieu was crying when he heard the news. "I felt like I disappointed my team," he said. "We’re in a playoff chase, so you just want to be out there and help those guys. A lot people say I should have went down (on the kick), but I don’t play like that." I felt like I disappointed my team. We’re in a playoff chase, so you just want to be out there and help those guys. "I know I played pretty good, think I set a pretty good standard for rookies coming in at defensive back for the Cardinals this year, but I didn’t feel like I played my best," he said. "I felt like the best was still ahead of me, so I’ve got some months to reflect on it and hopefully motivate me to go out there and set some records next year." "To be starting at the beginning of the year and then have Tyrann come in, it definitely is something you have to work through mentally because we all want to be starters," Johnson said. "But you just look at yourself in the mirror. You have to be a character guy and understand that everybody in this league is a great player so everybody’s not going to be a starter." "I was able to accept my role then, and now itâs going to grow bigger and get back to where it was." "Obviously, I’m still blessed," he said. "I’m just looking forward to the future. Hopefully everything goes well in the future and, knock on wood, I don’t have to do deal with this anymore." "I don’t know what to do," he said. "Maybe I’ll get me some popcorn."